As my due date grew close, I needed to funnel my fevered nesting energy into something productive, enjoyable, and not too labour intensive. Thus began the Twelve Days of Baking, to coincide with the holiday season and the many festive gatherings it brings. Starting the Friday before Christmas, I committed myself to baking one thing each day, until New Years day. I browsed my small cookbook library and purused my favourite food blogs for ideas and inspiration, and came up with a list of twelve baked goods that had some variety and could be gifted or shared easily. It was a rocky start. Day One's recipe rose higher than expected and bubbled over the sides of the pan, making a sloppy mess of the oven. Day Two's recipe was ruined instantly when I accidentally used mint extract instead of vanilla. But these things happen, and the Twelve Days continued on. On the night of Day Three, I prepared the dough for Day Four's slow-rise bread. Shortly after I went to bed, I started having mild labour contractions. They were just uncomfortable enough to keep me waking up every so often, and the next morning I was tired, worried, excited, and had a puffy dough that needed my attention. The dough was finished, baked, cooled, and shared at a family brunch at a nearby relative's house. The contractions continued through Day Four, becoming more frequent and stronger when we returned home mid-afternoon. A few hours and a phone call later, and our midwife was in our apartment assessing my symptoms. Active labour had begun, and continued well into the night. In the wee hours on Christmas morning, a beautiful baby girl was born in our bed. She was named Madeleine, like the sweet little French cake. After a week of bedrest and bonding with our new baby, I got back into the baking swing of things. Being able to finish off this baking project really helped me normalize my new life as a mother, and also remind me that I was still the same person I was before. I feel really good about the things to come. 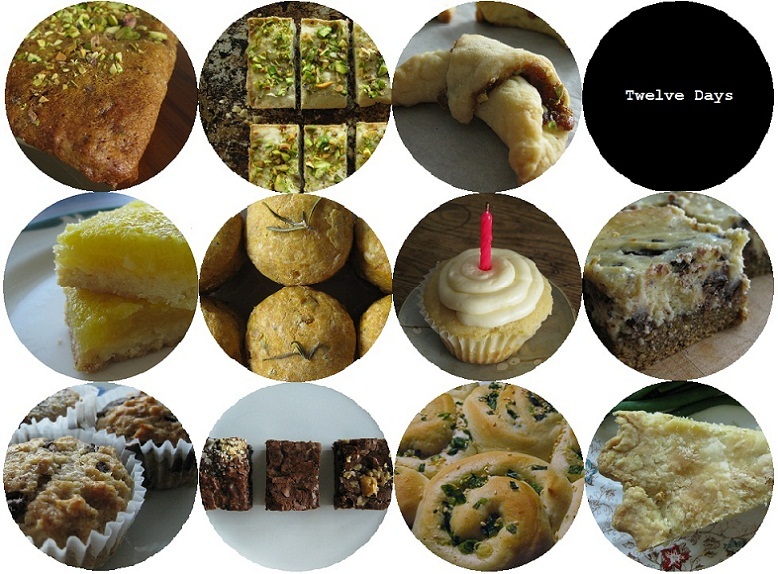 The recipes from Twelve (non-consecutive) Days of Baking are linked below; the online recipes, anyhow. Most came out nicely, a few not so nice. My personal favourites are marked with an asterisk (*). As always, leave me a comment if you want me to email you the full recipe.